Do you have a large kitchen window, and want to decorate the sill? Have a bit of space in your backyard for a couple small pots, and want to put that space to use? Are you a bit of a cooking fanatic? Whether you answered yes to one or all, or want to get into cooking or gardening, start thinking about growing herbs! Herbs are small and compact plants that can be harvested year round and used in cooking. Why plant them yourself? Because you’ll be able to harvest herbs when you need them, fresh from the plant, and boast a more flavorful dinner for little to no effort! Learn how to make a kitchen herb garden with these easy steps. First you’ll need to plan where you want to plant your herbs. Determine whether you have a windowsill large enough for a small rectangular pot, or a couple small pots. Check what kind of sun exposure they’ll have. If you don’t have the space or ability to grow them in your kitchen, then find a spot outside that you can comfortably grow them. A small herb garden is a great centerpiece for your patio table, and it keeps it at a good height for gardening and harvesting! 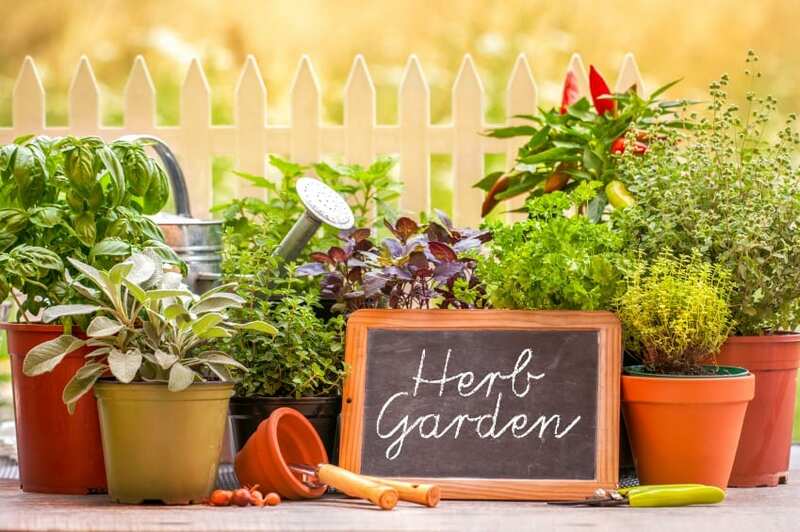 The easiest start to your herb garden is purchasing the plants already sprouted and young, so that you can just transplant them and keep them alive. However, if you wish to go the cheaper route, and get more bragging rights, you can purchase the seeds and try to start them off on your own. Check what time of the year to plant them, and be careful how often you water them. Follow the instructions on your packets, and try to be patient. Even if the packet says you’ll get sprouts in a week, it can take up to two weeks for yours to appear. If you don’t want just herbs and greenery, you can look up companion plants for the herbs you’ve chosen. Companion plants are plants that will grow well next to your herbs, and provide good help. For instance, basil and marigolds grow well together, and will help keep bugs off of each other. The bonus of companion planting is that you can have bright spurts of color in between your herbs, and even grow flowers for your dining room table! Once your plants are established, just maintain them. If they’re outdoors, you may want to invest in a fungicide, or other spray that will help your herbs grow without illness or pests. There are plenty that are considered safe, and can be used up to the day before harvesting. If you don’t want to risk that, you can always grow organically, and just focus on fertilizing and watering your new garden. Once the plants are established, you’re ready to harvest! Depending on the herb, you can harvest by pulling a couple leaves or an entire stem for use in your kitchen. They’re best harvested in the morning, when their flavor is strongest, but you can grab them as you need them, even during dinnertime!